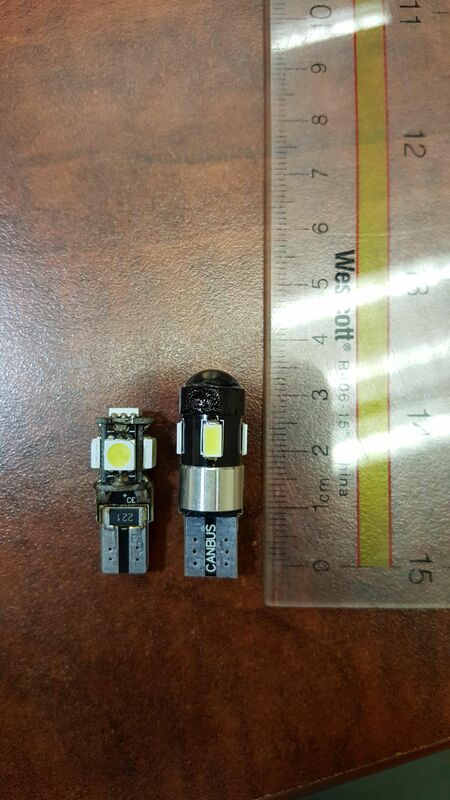 The OEM parking light bulbs are all glass, the LED ones are mostly plastic. I haven't riden much since I changed out to LED parking bulbs 2 weeks ago but I will keep an eye out and check it in a month if nothing blows out. I did note that the LED's I used are a bit longer than the OEM bulbs, I don't use high beam much but I bet the extra length puts the LED closer to the high beam bulb. I had a similar thought and inspected it in the housing. The bulbs I bought are slightly longer than the LED the previous owner had in its place (LED on the left in the below image). About 5mm. 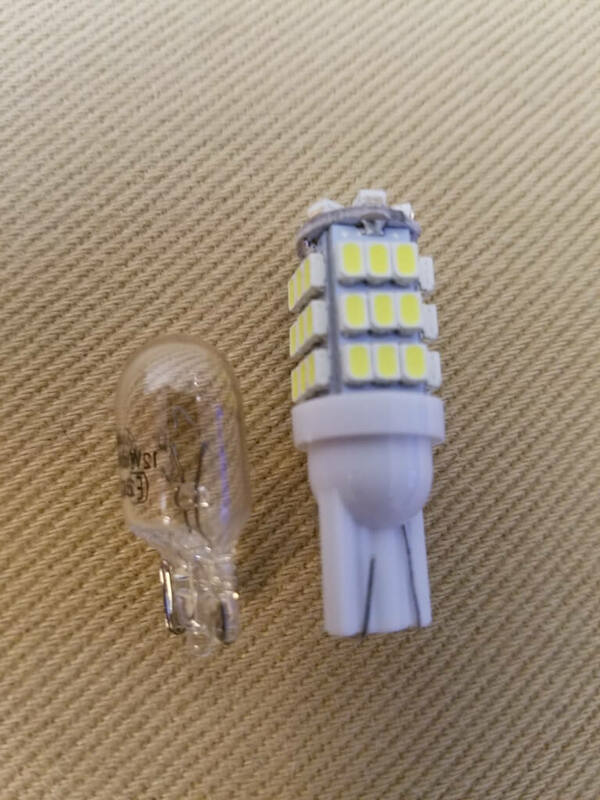 It's possible given the location of the melting point on the replacement (right LED in photo) that the previous bulb would sit just lower than that focused point of heat. But it still doesn't explain the smoke coming from inside the housing when the bright is on and the parking light is removed. Are you running stock headlights, Andrew? But it still doesn't explain the smoke coming from inside the housing when the bright is on and the parking light is removed. Are you running stock headlights, Andrew? Yeah that is weird. Seems like you have two options. ! take it back to a dealer after putting the stock guts back in and trying to get them to figure it out for free, or you are gonna have to figure out how to take the housing assembly apart and give it a look over for anything else that is melted. 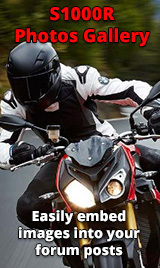 I would stay off the bike till you figure it out as it might not be 100% related to the LED's. Is there residue from the parking bulb still left on the high beam bulb that may be causing the smoke? There's a lot of clearance between the high beam and the LED, which is adding to my confusion. I have LED bulbs coming in this weekend for both the High Beam and Low Beam. Over the weekend I plan to get into the front assembly to install them and have a closer look at what could be going on. I also have a service appointment on Monday so thankfully I should be able to get everything addressed all at once. These are the LEDs I bought for my park lights, been in for a year and a half. Thanks, Simon. I'll have a look. Any issues with the heat from the stock high beam effecting the LED parking light or just that it's obscuring? 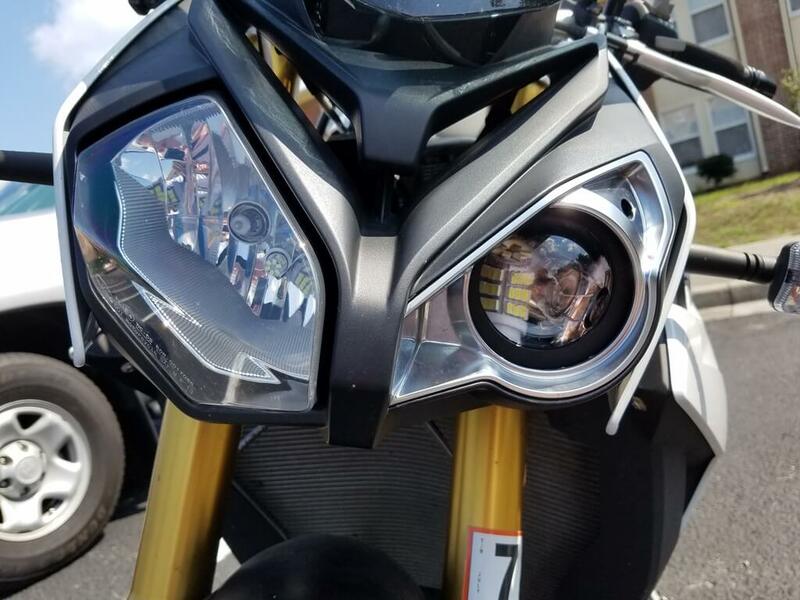 Yesterday I installed an OPT7 LED (link below) for the low beam and the difference over the Gotham Cycles HID kit is striking. The high beam is arriving today and will go in tonight. Based off of the less-than-24-hour experience I have with the OPT7, the much cooler operating temperature seems like it will solve the melting issue while giving me a brighter, whiter, wider beam. All positives in my book. Curious to see how the beam works with the projector housing, but I'm optimistic. Also in the name of science I have a pair of the LEDs Simon sugguested. We'll try all sorts of combos and see what sticks.